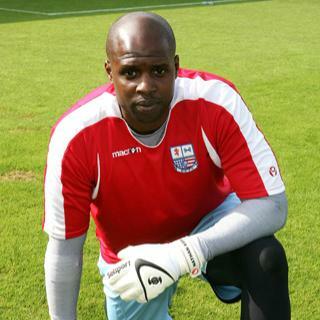 Goalkeeper Nathan Abbey was signed by Diamonds on 18 September 2009 at the age of 31. He had been out of contract having been released by MK Dons in May 2009. He started his career with Luton Town where he made over 50 appearances for the Hatters, before joining Chesterfield in August 2001. He won their ‘Player of the Year’ the following season, but failed to agree on an extended contract and joining for Northampton Town at the start of the following season. He played only eight games for the Cobblers however and was released in May 2003. He joined several clubs on non contract terms including Stevenage Borough, St.Albans, Luton Town, Macclesfield Town, Hayes, Ipswich Town and Burnley but failed to make an impression with any of them. In July 2004, he joined Boston United where he became their first choice keeper going out on loan to Leyton Orient in December 2005. before returning to be released to join Bristol City for the remainder of the season. In July 2006, Nathan joined Torquay United, before moving to Brentford in December. Before the start of the 2007/2008 season, he signed for MK Dons where he spent two season, before being released. He made his Diamonds debut on 19th September 2009, keeping a clean sheet in the 1-0 win against Mansfield Town. He went on to play 14 games – keeping a clean sheet on 5 occasions. After appearing 14 times in a Diamonds shirt, including 11 games in the Blue Square Premier, he left the club in December 2009 when his contract was not renewed. He joined Kettering Town on 15 January 2010 on a non contract basis. He remained with the Poppies for the following season, but was dismissed in November 2010 due to gross misconduct. On 13 July 2012, Nathan was appointed Assistant Manager at Southern League Premier side Arlesey Town, teaming up with his brother – manager Zema Abbey, and competing again for the No.1 jersey. Following his brothers appointment as Joint manager at Southern Premier side St.Neots Town, Nathan followed on 8 November 2013, taking up the Assistant Manager role. He was dismissed from the role with his brother on 28 September 2014 before returning to a similar role at Arlesey Town in 2015. After several seasons at Arlesey he became Assistant Manager with Bedford Town in 2018.